This page will provide information on new litters from our Member Breeders. Those who are interested in a basset hound puppy are encouraged to look here for information on new litters. Our members do not breed puppies very often. They usually breed when they are getting ready for their next generation of dogs for the show ring. The vast majority of the breeding stock used by them are basset hounds that are AKC Champions. A list of our Member Breeders can be found on our Member Breeders page. That page also has links to individual Member Breeder’s pages that some breeders maintain on our website. There are also links to some individual breeder websites where you can find more information on some of the breeders and their dogs. Before contacting a breeder check out our Reputable Breeder page and AKC Registration. All information contained herein is intended to assist persons attempting to obtain or research a purebred dog. 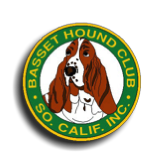 All listed contacts are members of BHCSC and are expected to follow the club’s Code of Ethics and breed as close as possible to the American Kennel Club Standard for Basset Hounds. Please do your due diligence in selecting a breeder if you plan to buy a puppy. Occasionally one of our breeders will announce a new litter and ask that we list available puppies on this page.